If the first step towards growing up is moving into a big bed, surely the second step is a bunk. Moving into a bunk bed is almost a rite of passage of childhood – I still remember my excitement as a child when I moved into the top bunk. What’s more, if you have more kids than bedrooms, bunk beds are almost a necessity. Here is a worthy addition to the list of bunk beds we have loved here at Babyology – the new offering from the design team at Oeuf. 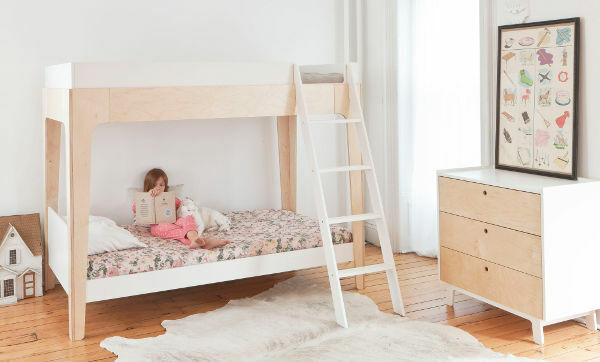 The new Perch bunks from Oeuf mark the company’s movement further into the realm of older children, with a design that gives every parent of more than one kid something to grin about. 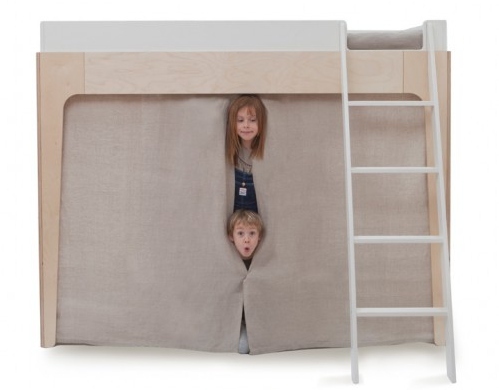 The Perch bunk bed is actually a loft bed and a separate single which fits in underneath. This means it can be configured as bunks (in a variety of positions) or two separate beds – a loft with space underneath and a single elsewhere. It comes in birch or walnut and co-ordinates perfectly with other beautiful pieces in the Oeuf collection. Both beds are slightly lower than most bunks on the market, which makes them less daunting for bunk novices as well as easier to reach. Like all the furniture from Oeuf, the Perch bunks have a small footprint so won’t take up too much precious floor space. Best of all, the Perch is more affordable than other designer bunks on the market, priced at US$1490. It’s not available in Australia yet, but we’ll let you know when it arrives. In the meantime, enjoy more of our past Oeuf posts or browse the local range at Kido Store.